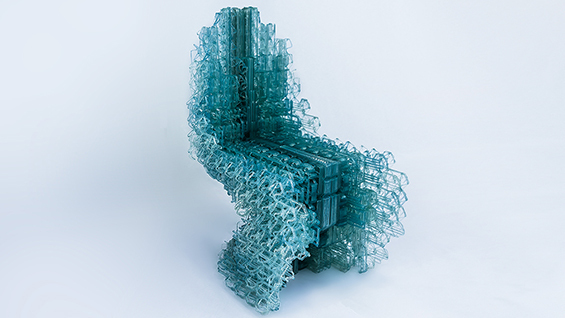 VoxelChair v1.0, Robotically 3D Printed Plastic Chair. Designed by Manuel Jimenez Garcia and Gilles Retsin. Fabrication Support: Nagami.Design and Vicente Soler. Centre Pompidou Paris, Permanent Collection. After two decades of experimentation with the digital, a better understanding of computation, robotics, material sciences and a research-driven architectural culture have pushed architects to question and revise the prevalent paradigm of continuous surfaces and formal differentiation. Architects may have in fact consistently misunderstood the nature of the digital, having mainly based their argument on the affordance of computer controlled machines to create differentiated forms. This new body of work is centred on the discrete building block or part: universal elements that are as scalable, accessible and versatile as digital data. The work presented in this lecture will describe the implications of an architecture that is fully digital - in its conception, production and organisation. This emerging discrete approach has major implications for how we design, produce and build architecture. The initially modernist understanding of architecture as an assemblage of prefabricated, discrete elements enters the new domain of the digital, where it results in a previously unseen architecture that is open-ended, versatile, complex and accessible to many. Manuel Jimenez García is the co-founder and principal of M A D M design, a computational design practice based in London, and co-founder of the robotic manufacturing startup Nagami, based in Avila, Spain. His work is part of the permanent collection of the Centre Pompidou (Paris), and has been exhibited internationally in venues such as Vitra Design Museum (Weil-am-Rhein), Canada´s Design Museum (Toronto), Royal Academy of Arts (London), Kursaal Museum (San Sebastian), Zaha Hadid Design Gallery (London) and Clerkenwell Design Week (London). Alongside his practice, Manuel is a lecturer at The Bartlett School of Architecture UCL (London). He is programme director of MSc/MRes Architectural Computation (AC), co-founder Design Computation Lab and curator of Plexus, a multidisciplinary lecture series based on computational design. He studied Architecture in Madrid and graduated from DRL at the Architectural Association. Gilles Retsin is an award winning London based architect, designer and educator. His work is interested in the impact of emerging technologies on the core principles of architecture. His practice has developed numerous provocative proposals for international competitions and commissions - such as the recently completed pavilion for the Tallinn Architecture Biennale in Estonia. His work has been acquired by the Centre Pompidou in Paris, and he has exhibited internationally in museums such as the Museum of Art and Design in New York, the Vitra Design Museum in Weil-am-Rhein and the Zaha Hadid Gallery in London. He is Program Director of the B.Pro Architectural Design (AD), and co-founder of the Design Computation Lab at UCL the Bartlett School of Architecture in London. Gilles Retsin studied architecture in Belgium, Chile and the UK, where he obtained a masters from the Architectural Association (AA) in London.